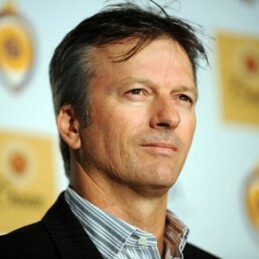 Steve Waugh AO is Australia’s most successful and beloved Test cricket captain. Steve’s accomplishments have been recognised with the 2001 Allan Border Medal and, under his leadership, the Australian Test Cricket team was named the ‘Best Team in the World’ at the prestigious Laureus Sports Award in 2002. In 2003 Steve was honoured with the Order of Australia for services to cricket and charity. In 2005 he was named Australian Father of the Year. Steve is forever immortalised with the Sheffield Shield player of the year being awarded the Steve Waugh medal. Steve’s cricketing talents were first identified at the age of 17. He was selected to play for New South Wales while playing first grade for Sydney. He made his Test debut on the 1985 tour of South Africa. Steve retired in January 2004, after 18 years at the highest level, leaving behind an incredible highlight reel as the highest Australian Test run scorer. Steve captained the Australian Test team between 1999 and 2004 and the one-day team between 1997 and 2002. He was known to all who played under him as an inspiring leader. “I try and instill faith in the players and give them self-belief and really empower them to be the best they can be”. In 2009 Steve became the 30th player to be inducted into the Australian Cricket Hall of Fame. One of Steve’s favourite philosophies on life is “If you don’t stand up for something, you’ll fall for everything”. His philosophy was tested during a visit to India in 1986. Struck by those he witnessed suffering from leprosy, Steve felt compelled to get involved. Steve has been a hands-on contributor to the Udayan Home in Barrackpore, India. The home takes children from their leprosy environment and provides them with healthcare, education and opportunities. In 2007 Steve launched his charity; The Steve Waugh Foundation. Steve also works as a patron of Camp Quality and the Conductive Education Unit for the Spastic Centre of New South Wales. Steve’s passion for helping those who are less fortunate than himself was recognised when we was named the Australian of the year in 2004 for his cricketing accomplishments but also for his work with charities at home and abroad, most notably in India. Steve Waugh is a real draw card as a public speaker. Australians love to hear of his journey as a cricketer, best-selling author and humanitarian. An articulate and inspirational speaker, Steve is a fantastic speaker for sporting and non-sporting audiences alike.